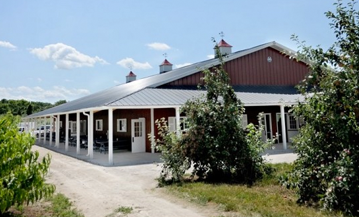 Our Family Farm is available for special events and parties! Open all year, Apple Holler is a great place to host your special event. Whether you’re planning a wedding, birthday party, business or corporate event, group picnic, family reunion, wedding rehearsal or shower, we offer many fun-filled activities to make for a memorable get-together. Enjoy our unique atmosphere of a real family farm. We can accommodate your group outing, whether you want it outdoors in our beautiful enchanted forest or indoor our large new barn. We also add convenience to your party planning by offering you an extensive farm-to-table catering menu and fun options to choose from. Please give us a call at 262-884-7100 to plan your next group event. We recognize that your wedding is so much more than one special day; it is the beginning of a beautiful journey and the joyful union of two families. With this understanding, we work to provide exemplary service in an enchanting setting for your most important celebration. Make your wedding as unique as you are and call our personal planner at 262-884-7100 to customize your special day. We can host Weddings, Receptions, Engagement Parties, Showers, Rehearsal Dinners, and even Gift Opening Brunches. 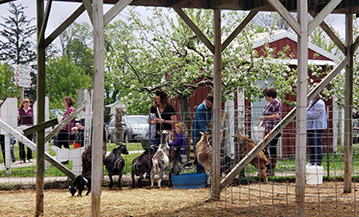 We have many exciting, educational, and engaging experiences that await your children with special adventures down on the farm. Children can visit us with their group or school for a fun field trip, where they can experience the new Johnny Appleseed show or find gems and fossils with Gemstone Mining — or host a birthday party (up to 20 children, adults are free) between May and July, where kids get to hang out at the Farm Park and Kids Corral Play Area! 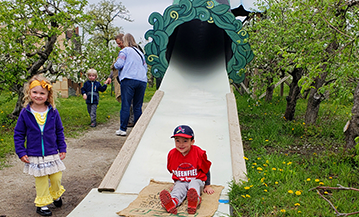 Our Ag-venture Farm Tours can include a tour of our apple, pear and peach orchards, and hardwood forests; and visits to our pollination exhibit, organic pizza garden, haflinger horses and barnyard animals. 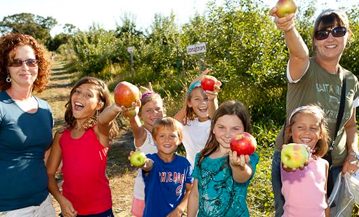 With 78 acres of orchard and farm, Apple Holler serves are the perfect venue for your large group event! From Corporate Parties to Family Reunions and everything in between, gather your group for guaranteed good times and memories to last a lifetime. I wanted to pass along a great big THANK YOU for making my daughter’s 6th Birthday Party very special. Your attention to details and your flexibility with the planning of the party made the day extra special. The grounds and food were terrific and I know I speak for the 80 plus people we had at the party that it was a wonderful day. My wedding at Apple Holler was pure magic. Not only was it everything I wanted, but our guests told us it was the most beautiful, authentic and BEST wedding venue they’d ever been to! Sheri went above and beyond to make sure our wedding was perfect. Sheri’s tireless dedication, tremendous energy and forethought in pulling off the most beautiful wedding ever is commendable. The personal investment to ensure our happiness and expectations were met was remarkable. From the bottom of our hearts, we can’t thank you enough for all of it, especially your hard work, in giving us a beautiful, lasting memory. Everyone was so willing to help and the staff went ABOVE and BEYOND our expectations. Our photographer literally said, “this is the best wedding I have ever photographed!” Because everyone was so nice and relaxed, everything went smoothly.